This is the first lab assignment in the laser tag course. This lab covers Ohm's Law, LEDs, buttons, breadboarding and schematics. The purpose of this lab is to help you to understand how voltage, current and resistance are interrelated, how to connect circuit elements on a breadboard and how to read schematic drawings. Before you can build a circuit, you need to know how to connect the parts together. To do this, we are using a solderless breadboard, which is a prototyping tool that is used to connect parts together without permanently bonding them (not using solder, which is a metal that you melt onto wires to connect them). A solder less breadboard has holes in it where you put the wires in to connect them to each other. 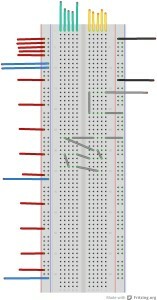 A picture of a breadboard is shown below to demonstrate how a breadboard is used to connect components together. In Figure 1 above, the wires are connected to all of the wires that are the same color. There are four rails (holes that are electrically connected) that go down the left and right sides of the breadboard. These rails are connected vertically. For example, on the left most rail, all of the red wires are connected to each other and all of the blue wires are connected to each other, but the blue wires are not connected to the red wires. These are usually where you place battery power, with positive voltage on the side of the rail with the red line (this has the red wires in it) and the negative voltage on the rail next to it (this rail has blue wires in it). 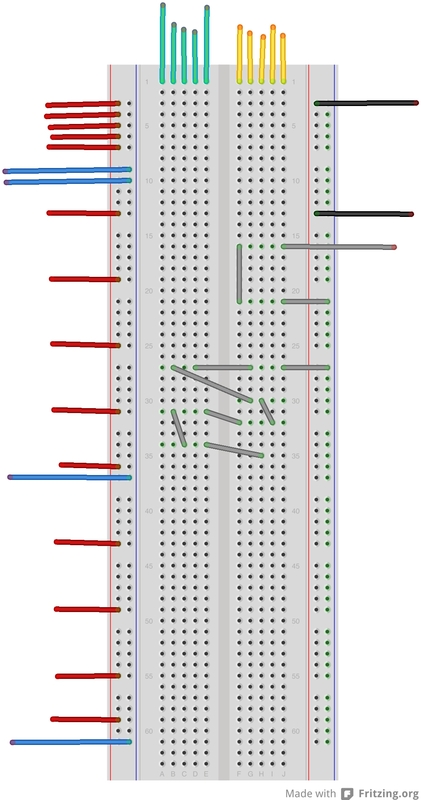 The middle part of the breadboard has rails that electrically connect the holes horizontally (as the green and yellow wires show). This part of the breadboard is separated into two sections (the green wires are all connected, and they are not connected to the yellow wires). For a true test of connectivity, see if you can explain why all of the grey wires are connected to each other. The materials that are required to do this lab are: a 9V battery, 9V battery clip, LED (any color), assorted resistors, solder less breadboard, wire, wire strippers (for cutting different lengths of wire). You need to connect the battery, LED, button and resistor on the breadboard so that electricity can flow from the positive terminal of the battery (red wire), through the button, then the LED (through the positive [longer] leg of the LED) to the resistor, and then to ground (negative voltage, or the black wire in Figure 2 below). Build a circuit to turn on an LED using a push button. Calculate the resistor value (how much resistance) that is required to have only 0.02 Amperes (20 mA) go through the LED. The circuit is shown on a breadboard in Figure 2 and the schematic is shown in Figure 3. Find the resistance values you would need for the current consumption to be 5 mA, 10 mA, 15 mA. Build these circuits too and see how the light coming from the LED is effected. Why does this happen?